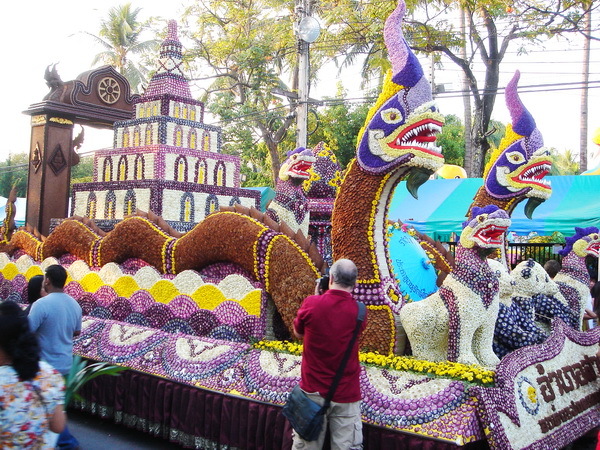 Chiang Mai, Thailand, is the undisputed festival capital of Thailand. Between November and April Chiang Mai puts on several huge festivals that draw crowds of tens of thousands, visitors from all over Thailand and from all over the world. A major festival is not just a one day event. Normally they last three days and in one case, Sonkran, even seven days. During those times Chiang Mai turns into a giant party, a traffic nightmare, and a major holiday destination for Thais. Train tickets in and out of the city are sold out weeks in advance, and it seems that half of the population of Bangkok converges upon Chiang Mai. The organization of those gigantic festivals is a real accomplishment. Major streets have to be blocked off, hours long parades stop traffic all around the center of town, and parking is next to impossible to find. But nobody complains. Thais are remarkably tolerant and patient. After all, everyone came to town to have a good time. Chiang Mai is an old city and was never designed to accomodate lots of traffic. The inner city is full of small lanes which are just big enough for one car to pass through – barely. The new section of the city has wider streets, but city planning was clearly overtaken by the popularity and the influx of tourist in this “Rose of the North”, as Chiang Mai is called. 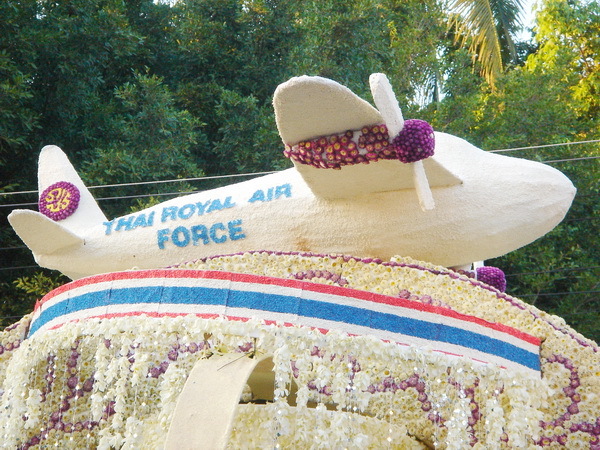 Speaking of Roses, the annual flower festival uses countless thousands of flowers to decorate a long line of floats which are all built around individual themes. The float designers are competing with each other and at the end of the parade a panel of judges selects the best floats. The winners receive prizes. You find everything from elephants, dragons, temples, historic buildings, lions, Thai air force fighter jets, landscapes and other designs all made out of flowers. 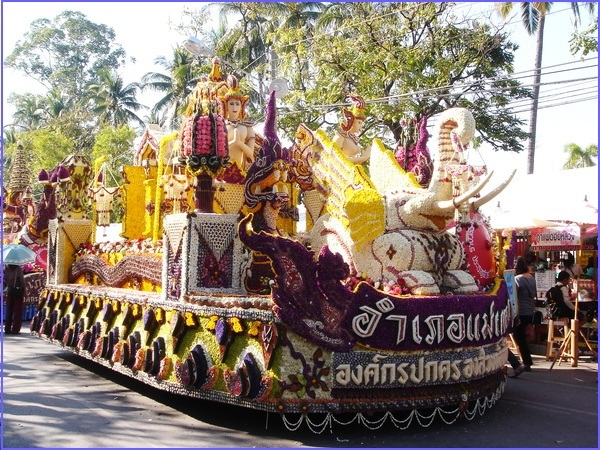 Those creations are mounted on trucks and parade through town with smiling Thai beauties sitting on top and gracefully waving to the crowds. After the parade the floats are parked on a major city street which has been converted into a giant marketplace. 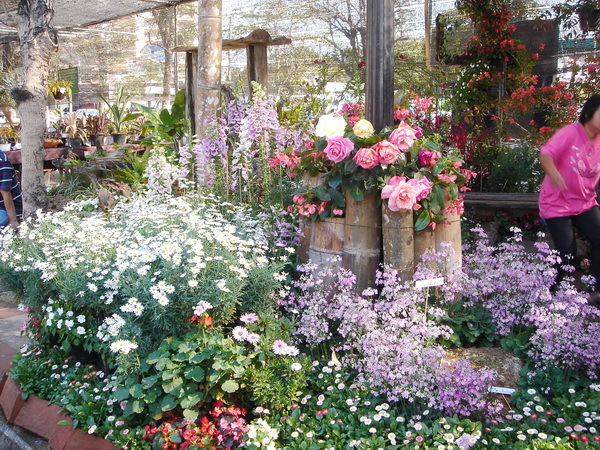 There are lots of flower exhibitions, arts and crafts shops, massage shops, and of course food vendors. No matter what the festival is all about, eating is always on the very top of the agenda for any party in Thailand. 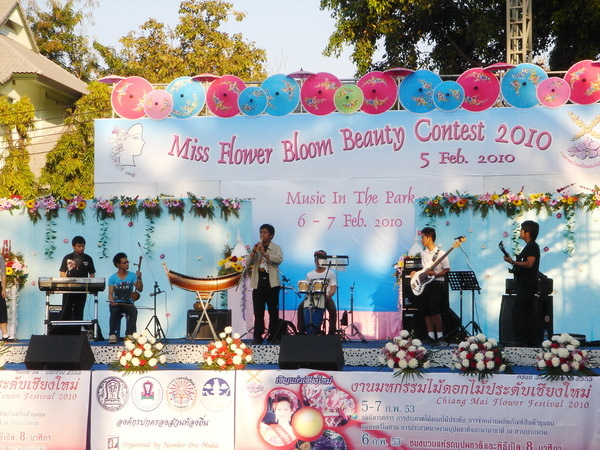 Right next to the festival grounds is Chiang Mai’s city park which also turns into a gigantic party with a big stage. Musicians and dancers perform, and beauty queens are selected in several categories. People sit on the grass next to a pretty pond and watch all the fun. 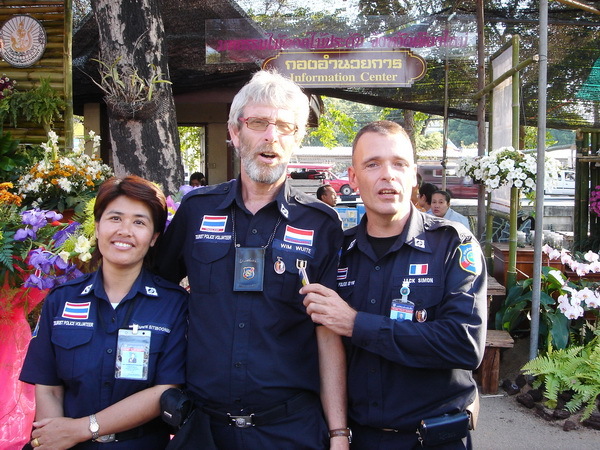 Chiang Mai has created a multi-national tourist police force which is partly staffed by full time police officers and partly by volunteers from several countries. During the festival you can hear announcements in Thai, English, German, Spanish, Dutch, and French. The tourist cops are friendly fellows and they enjoy the fun just like everybody else. I highly doubt that you would ever see a uniformed cop in Europe or America getting a massage in public. One of the officers, a frenchman, had his 18 year old daugther visit him from France. She took part in the contest, and two days after her arrival she was crowned as one of the beauty queens of the flower festival. She spent most of the day posing for hundreds of pictures, with her tourist cop dad beaming with pride. What an experience for an 18 year old visitor! 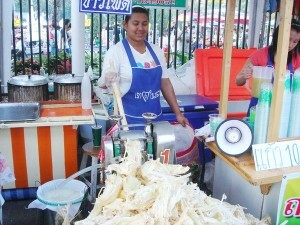 The Thais have an amazing array of food stalls at all festivals. 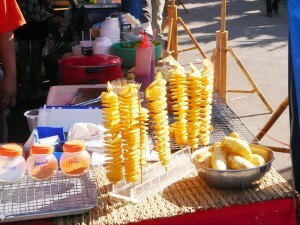 Potatos were never part of the Thai diet, but times are changing, and the Thais came up with a new version of French Fries – French Spirals on a stick. They became a big hit instantly. Sugar Cane Juice, one of my Favorites! One of my favorites is the fresh squeezed sugar cane juice which is as much fun to drink as it is to watch it being made. Thais are fun loving people, and gigantic festivals are one of the big attractions of Chiang Mai. Most of them take place in the dry winter season when temperatures are moderate and rain is almost totally absent. There is such an abundance of color, music, food, arts and crafts, dance, performances, and parades that it is pretty hard not to have a really great time in this city during festival season. Would love to attend this festival, I have been to Thailand and it is a beautiful country with wonderful people. neat article! thx for the info! luv to be able to go!